Antique Radio Forums • View topic - How to cut glass envelope of 6X5G tube? How to cut glass envelope of 6X5G tube? Post subject: How to cut glass envelope of 6X5G tube? I am planning to build a solid state rectifier to replace the 6X5 tube in my Zenith 5808 chassis. I know that there are a lot of ways to do this, but here is my idea. I would build it in the base of a dud 6X5G tube, I just so happen to have an original Zenith 6X5G tube with an open filament. I would use two 1N4007 diodes in series on each plate pin. At the junction of the common cathodes, I would connect them to a #47 lamp (6.3 volt/150ma) to be used as a fuse in case the B+ would short to ground in the future. As an alternative, I could use a 1/8 amp pico fuse. Anyway, the otherside of the #47 bulb would connect to a 120 ohm or so, resistor to provide the necessary voltage drop to equal the 6X5 voltage drop. All of this would fit neatly inside the envelope of the old Zenith 6X5G and it would have a dim orange glow from the #47 bulb. I think it would be kind of neat! So my question is, how can I cut the envelope near the bottom of the old 6X5G tube without destroying it and in such a manner that it can be glued back together? Is this possible? Use a diamond cutting wheel on a Dremel tool. The Dremel brand wheels are fairly expensive ($12-15) but you can find the cheapo ones on ebay 5 for $8.00. I can tell you what I tried, but it didn't work too well. I used a carbide wheel on my Dremel tool to cut the glass. The difficult part is having a drip of cooling water to prevent the glass from cracking or melting back together. The water drip causes a massive amount of spray when the wheel hits it! I was partially successful with my first attempt. I got the envelope cut off near the socket base, but had a few chips and ragged edges. Maybe with more practice, I can do better. My solution is to buy clear acrylic tubing and use it in place of the glass. I use orange LEDs as "filaments" powered by the filament voltage that lit up the real tube. Use a diode and a current limiting resistor to make sure you don't over drive the LEDs. Your idea about using a lamp as a fuse/filament is neat, but you may end up having to replace lamps often. Also, if you use a fuse or the lamp, the inrush current when charging your filter electrolytics may blow the fuse. For my homebrew radios, I use an LM386 audio amp chip inside one of my octal base acrylic tubes. The whole amp ckt, including a rectifier and filter operates from the 6.3 V filament supply. 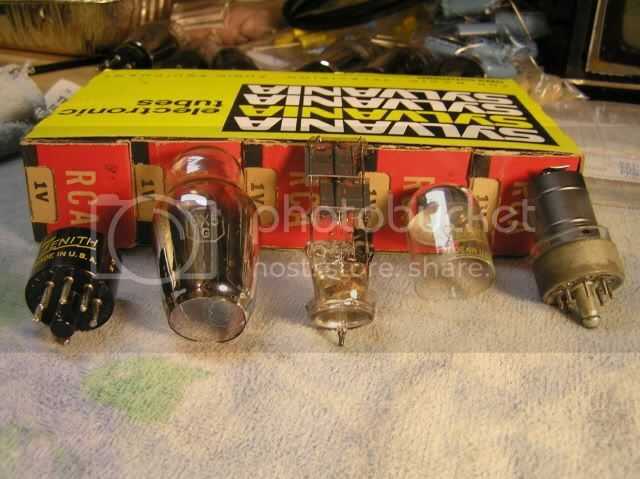 Makes a nice amplifier for crystal sets and one-tubers, while still keeping an antique look. Have you thought of removing the glass from the base? You will have enough room between glass & base for 1N4007 diodes. Then the glass can be glued back into the base. The lamp could be added some other place in your radio. Best this way as it may burn out and need replacing. There are grain of wheat lamps that would fit between glass & base. Thanks for the ideas. One idea I had was to cut or scribe the glass along the base with an exacto knife or surgical scalpel making several repeat cuts, with the hope that the glass would break evenly with a slight rap. Sounds kind of iffy. I guess if I were to try this, I wolud try it on a less desireable dud first to see what happened. You need a husky filament transformer and some single strand #20 or #22 AWG bare wire. Connect the ends of about a foot (whatever it takes to make ONE turn around the tube) and where you want the break, wrap one turn of the wire around the tube. Keep as much tension on the wire as you can, without breaking it and turn on the juice. In a few seconds, the wire will get red hot and the glass will snap where it contacted the tube glass. The result break was very smoothe, so smoothe, that I drank a cold 807 out if the new "glass" I made that day in school! By the way the filament transformer I used was a 6.3 volt at 10 amp job, and it provided plenty of power to get it done in about fifteen seconds. I learned that trick from an old timer who used to work for an outfit that rebuilt TV picture tubes. 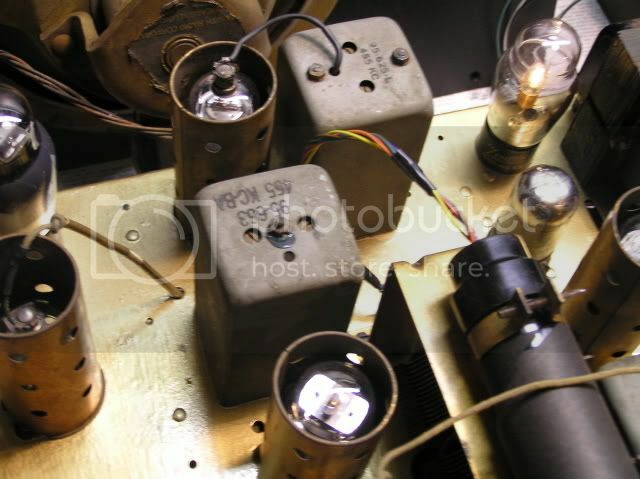 They would do the same thing to cut the neck off the old tube right in front of the base and then replace the electron gun and go on from there when rebuilding picture tubes. I have done it several times. After boiling for 10 minutes to loosen the tube from the base, unsolder and remove. I use needle nosed pliers to gently break the glass bottom. Small piece by piece, chipping away until I have enough room to remove the broken and squeezed "guts". Oh yea, all this is done underwater! It absorbs the shock of chipping. Afterwards I use a stone on my Dremel mostly under water to clean up the opening. I would have used a Dremel cut off wheel if I could find them .....underwater of course. Wow! I'm encouraged. Obviously, this can be done. I think I will give both methods a try. I think I have a 12volt 20 amp transformer kicking around here. I could put it on my variac (120v/10amp) to adjust the current flow on the wire. Curt, another idea I thought of was to remove the tip on a D-550 soldering gun and attach the wires to it, using it to heat the wire. What do you think? That should work. But I didn't have an iron or gun of that type available, so I used the transformer. The main thing is that you want to completely surround the tube and keep the wire tight without shorting the ends of the wire. We did that in school with Nichrome wire and a battery, clothespin. We used a piece of mica between the wires inside the clothespin. Only took ½ second with a car battery on a Mason jar! I am definitely going to give that a try. Mike, when you boiled the tube to loosen the glue in the base, did you find it had a tendancy to remove the painted logo on the tube base? It would be nice to maintain the old Zenith logo on that tube, if possible. Also, I forgot to mention earlier that not only did my dud 6X5G have an open filament, but coincidently, it also had a plate #2 to cathode short. Surprise! Surprise! I can just image the fireworks when that short occurred. It probably lit up like a roman candle, lol!I'm surprised the power transformer in that set survived. Mike, when you boiled the tube to loosen the glue in the base, did you find it had a tendency to remove the painted logo on the tube base? No, not on any that I tried, about ten so far. I boil them, then with rags try and twist back and forth. Some come clean, some really need force. The cement doesn't seem to dissolve, rather just release it's hold on the glass. Your suggestions worked beautifully! Here are the results. For my test setup. I used a low voltage transformer I had kicking around here. It turned out to be 30 volts A.C. at 20 amps. Yes it was overkill, but it was available. I connected it to my variac so I could control the current. I used about 12 inches of what looked like #24 enamel wire from an old tv yoke. I took Mikes suggestion and used a wooden clothes pin to hold the tension and put a one turn wrap around the locktal tube, being careful to slightly seperate the wires as they overlapped under the clothes pin. I connected the one turn loop to the secondary of my transformer and put the juice to it. Using an amp probe on the secondary, I dialed it up to about 10 amps. The wire turned red hot and in about 15 seconds I heard a tick and the deed was done. A perfectly clean cut with no sharp edges and no broken glass. Being encouraged by this success, I followed Mikes suggestion and boiled my 6X5G until the glue at the base was loose. I was then able to break the wires in the base and remove the envelope. I followed the same procedure to cut the envelope open, except for the fact that on this type of envelope, the wire loop wanted to slide down constantly because of the taper. I finally used masking tape to hold the wire in place while I put the juice to it. It worked fine, although the tape started to burn during the process. No problem! As you can see the cut on the 6X5G was fine, with no sharp edges, although it was not perfectly square because I could not hold the wire in place exactly. However, any variation in the cut is below the base and will not show anyway. This procedure is quick, easy and very reliable. Thanks to both Curt and Mike for their ideas. p.s. If you need a nos 1V tube, as you can see, I have some. Ed- glad that it worked for you. Sometimes it takes a bit of practice to get it right, but it works. When I did it in school over 30 years ago, some of the guys were thinking of making "ship in a bottle" copies. However I graduated before I ever learned the results of their experimenting. But they were all going to use larger whisky bottles. That's really cool. I wonder if the same trick could be applied to an eye tube. That is, cut the envelope open, install a tiny S-meter or some other clever solid state indicator, and glue it back together? I finished my solid state 6X5G. Here it is in operation. I used two 1N4007 diodes in each plate lead and a 150 ohm 2 watt resistor in series with the cathode. The output voltage is identical to that provided by the 6X5GT that I used previously. The light is provided by a #47 lamp which acts as a fuse/lamp. This radio draws about 70ma so the lamp lights about half normal brilliance. There is a turn-on surge when the filter caps charge, but it does not seem excessive. I guess time will tell if the lamp holds up. I wanted to fuse the B+ fairly close so I stuck with the #47 lamp. If it proves to be a problem , I can switch to a #44 (250ma) lamp. I secured the envelope to the tube base with G.E. Silicone II, using a small bead around the perimeter of the base where the glass of the envelope contacts it. It holds the envelope securely, but should be easily removable if necessary to change the lamp. I thought it was "Slicker thatn Owl ****"? At that is what my mom says. What I have done in the past for a solid state rectifier replacement is to put a dud in the socket that has a good filament and connect diodes underneath the chassis. It would also work to install the diodes in the base of the dud tube, that way you could clip the plate and cathode leads for safety but leave the filament. As I have mentioned in another thread, good 6X5 tubes are so easy to come by that I have never found it worth my while to rewire a socket or to use a solid state substitute, different story on an 84 or a 25Z5 which are harder to locate.